Dairy farmers are under increasing pressure to improve pasture consumption and make very careful use of purchased feed in order to maintain a profitable business. Monitoring of the key factors that drive profit is a crucial part of any management process. If done regularly and consistently monitoring provides the opportunity for timely corrective management and then to rapidly see the response. The MID Dairy Farm Productivity Tracker project captured all the feeding data from each of the twenty participating MID dairy farmers every ten days. Farmer participants provided data on milker numbers, milk fed to calves, supplements fed (purchased and own, quantity, quality, price, waste estimate and fodder conserved), change in body condition and stage of pregnancy, and grazing area and grazing rest time. All of this information was presented back to farmers within three days in table form as well as being presented graphically for ease of interpretation of the main drivers of feeding profitability. The graphs show trends and, over subsequent years, yearly comparisons. The data of all farms was consolidated and group graphs showed the group average, group top 5 %, group bottom 5%. 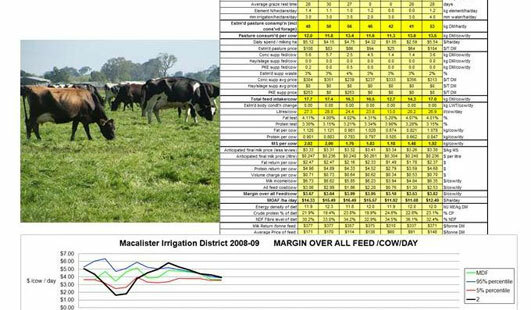 The Macalister Demonstration Farm graphs were also shown in the consolidated district graphs. All individual data was kept confidential with no individuals identified in the consolidated data that was released publicly. Consolidated data and graphs were made available to the broader industry through the MDF Newsletter and regular media articles, providing a comprehensive picture of the physical feed and milk production of the district’s dairy farms. The range in feeding profitability measured as Margin Over all Feed (MOAF)/ha/day in 2009-10 was $7,208 down to $387 with an average of $4,831/ha/day and in 2010-11 from $9,682 to $5,928 with an average of $7,941/ha/day. All of the farms in the project (where data is complete) improved their feeding performance and profitability measured as MOAF/ha/day from 2009-10 to 2010-11. The largest jump in performance of any farm was $7,970 MOAF/ha/day while the least improvement was $712 MOAF/ha/day. The average improvement for all twenty farms was $3,110 MOAF/ha/day. The largest contributor to this improvement was the milk price but most had tuned their system in some way, mainly by increasing purchased feed or by increasing herd numbers, in response to an anticipated better return. High margins per cow and per hectare result from high milk production per cow coupled with good grass consumption per hectare. Grass consumption per hectare, delivered by good management and a high level of grass growing inputs, associated with an appropriate stocking rate, delivers a high amount of cheaper grass per cow. Improved feeding margins and the expressed perceptions of the farmer participants indicates that the Tracker project has resulted in changes in feeding management that have had a positive impact on farm performance. Farmers can benefit from complex data if they are trained to manage it, if it is current and they have respect for its integrity. The Tracker project resulted in a much greater focus on pasture management to maximize pasture consumed and raised the importance of feed margins/hectare as an important profit driver. Benchmarking or comparison to other like farms can have a positive motivating effect on dairy farmers. While talking to other farmers was important to the success of the project, it was less significant as a motivator to act than was expected. Projects like the Tracker project may play a positive role in raising the computer skills of farmers.